She walked in not knowing what to expect. She’s been to competitions all her life, but this wasn’t like the rest. This was different. There’s no preparation for the feeling of being surrounded by 63,000 people. HAPPY WINNERS – Olivia Fazzino, left, and Katherine Fazzino proudly display their State Fair of Texas Agricultural Science Fair Champion ribbons. Katherine Fazzino, Rudder High School senior, was not 12th in the nation. She earned second place in her category at the 2015 National FFA Convention and Expo in Louisville, and now she’s hungry for more. Headed back to the national convention for the second straight year Oct. 19-22 in Indianapolis, Fazzino hopes to earn first place in the environmental and natural resources division. And she’s not alone. 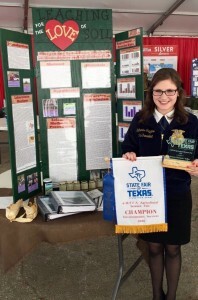 Her little sister Olivia, Rudder High sophomore, will be competing in the “greenhand” division, qualifying as a freshman during the July state convention in the plant systems category. Going to Indianapolis together excites both sisters almost as much as going to the national convention. Katherine said she was more nervous more about whether Olivia would get to go than she was herself because she feels being at the national convention is an experience that she wants everyone on her FFA team to experience. When talking about Olivia’s progression in the FFA program, she said it was similar to the maturation she experienced learning from her older sisters. Olivia has three more years in Rudder FFA and she plans on cherishing every minute of it. ORGANIC SUCCESS – Olivia Fazzino stands next to her winning science fair project. “My favorite thing about Rudder FFA is all the people because they are all so fun and they believe in the things I believe in,” Olivia said. A Fazzino doing well in FFA is not an uncommon site. 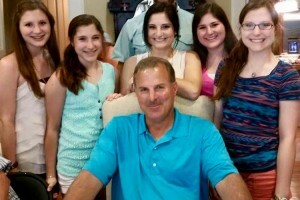 There are five Fazzino sisters and all of them experienced success with Rudder FFA. Larry White, agriculture teacher at Rudder, said there’s a reason for their success. Like many Rudder FFA alumni, Fazzino girls who graduate come back to support the program. Because the program is entrenched in the Brazos Valley community, it’s easy to find an event where they are serving. PROUD DAD – From left, Katherine Fazzino, Olivia Fazzino, Anna Marie (Fazzino) Drymalla, MaryFrances Fazzino and Rosemary Fazzino stand above their dad Lee Fazzino, Jr.
From working with children at the Twin City Mission to participating in the KBTX Food for Families drive, as well as many other events, Rudder FFA students, sponsors and family members are a common site in Bryan and surrounding areas. This community service helped the chapter place third out of 1038 active FFA Chapters in the state of Texas at this year’s state convention earning the chapter a “Golden Horizon” award for total involvement in the school and community. In a press release, the FFA said it considers its Golden Horizon award “the highest state rating to be bestowed on an FFA chapter.” Also at the state convention, Rudder FFA placed eighth in the state as an overall chapter to win the Gold Emblem National Chapter Rating and advance to nationals to be judged in the National FFA Chapter Contest. Rudder FFA started with just 39 students when the school opened in 2008. It has grown to a chapter of over 400 students. Katherine said there’s a reason the program is so successful. In preparation for nationals, Katherine and Olivia aren’t slowing down. 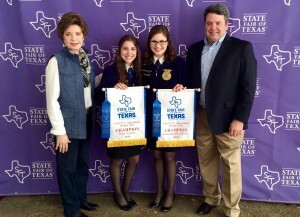 They recently earned first place in their divisions at the State Fair of Texas’ 4-H/FFA Agricultural Science Fair. The prizes came complete with a $1,000 scholarship for each sister. 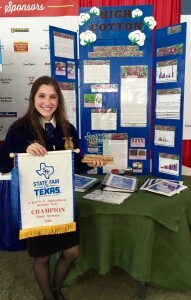 SOIL POWER – Katherine Fazzino shows off her State Fair award-winning science fair project. Scholarships are something the sisters have become accustomed to earning. As a senior, college is on the horizon for Katherine, and she’s very appreciative of opportunity scholarships bring. Olivia and her are planning to attend Texas A&M to join their sisters MaryFrances and Rosemary who are currently attending the university. Anna Marie Drymalla, the oldest Fazzino sister, graduated from Texas A&M and is working as a teacher in the area. Katherine, who wants to major in agribusiness and minor in economics, said FFA prepares students for all walks of life. Once called Future Farmers of America, the official name of the organization is now the National FFA Organization, welcoming members who aspire to be teachers, doctors, scientists and many other professions. Katherine said skills gained in FFA like interviewing will be invaluable to whatever career she chooses. But those thoughts are for the future. Right now Katherine is focused on the task at hand – nationals. “Winning would be really exciting because that would mean that all my hard work these past three years is finally coming together,” Katherine said. “I really want people to know about Rudder FFA because Rudder FFA is such an important part of my entire life,” Katherine said. Follow this story on Facebook. Previous Previous post: Welcome to Our New Look!